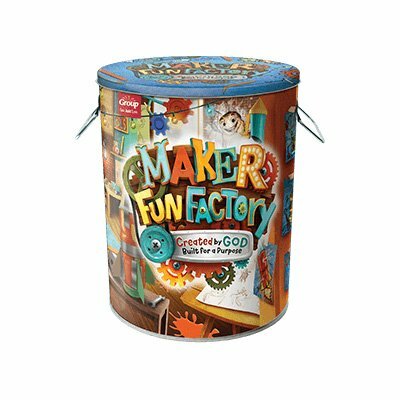 Maker Fun Factory is the newest VBS 2017 theme, just released by Group. We’re so excited about this inventive theme, that promises tons of interaction and imagination for kids and leaders alike. While some of you are still in the midst of VBS 2016, we wanted to share the top things you need to know about this upcoming course so you can share in the excitement and anticipation with us! Maker Fun Factory is the Easy VBS from Group, so it’s a perfect follow up to Cave Quest VBS . You can expect the fun, engaging, hands-on Bible learning experience that Group VBS is known for. After experiencing the cave snot in this year’s imagination station, we can’t wait to see what the Maker Fun Factory imagination station will hold! At Maker Fun Factory children will learn they were created by God for a specific purpose. Studying Bible characters from Gideon to Abigail teaches children more about who God is and how He made them for a reason. Fun, interactive decor, hands-on experiments during Imagination Station, action-packed games and Bible Discovery Time help kids become more confident in who they are and to look for God’s purpose in their lives.